Or, if you've already got this in the bag, show off your skills with our round-up of 6 most spectacular spots in the world to take a selfie. While the latest smartphones are getting even smarter with power-packed features such as image stabilization, spot a smile and beauty mode etc, great photography can often be overlooked – it’s actually a lot simpler. Cropping is the key to image editing as it sets the composition. Generally, you should aim to follow the rule of thirds (imagine an image is divided into 9 equal sections), which offers a guide to help place the photograph's compositional elements along the lines. For example, if you want to capture a fabulous sunrise, crop the image so that the horizon is situated in the bottom 3 grids, leaving the upper ones free for the orange-red sky. Proper lighting brings depth and richness to your holiday pictures, so try to use natural light as much as possible. While indoors, shoot near an open window instead of using artificial light (this can sometimes give a yellowish tint to your snaps), or capture the moment in the golden hour (an hour or so after sunrise or before sunset) instead of at dawn or dusk. When taking photos on your mobile, you may find that the camera tends to over-highlight your photos, making them appear over-exposed - if you're taking a photograph of a bright sunset or the twinkling sea for example. It's easier than you think to fix this. Simply tap and hold the brightest section of the photograph and a box will appear with a small sunshine symbol, (this is based on iPhone and Samsung) this focuses the camera and locks in exposure, so you can snap sunlight shots to your heart's content! High Dynamic Range (HDR) is a setting available on some smart phones which helps to process the photo slightly differently, capturing greater detail from the darker spots of the image, the function aims to gather different exposures for the same shot, but this doesn't always pay off. The solution? As we've mentioned, it's best to keep Instagram photos looking as natural as possible, so turning off your HDR will be best in this instance. Tilt-shift photography represents the finishing touches on a smartphone camera. It's used to highlight or exaggerate a specific section of a photograph, using a blur tool which comes in two options: linear and circular. If a linear blur is what you're aiming for, try to ensure the photograph has a distinctive foreground and background, so the object that's in focus can stand out. Circular tilt-shifts create a ring whereby everything inside the ring will be in focus, and everything outside will be blurred - you can manually choose which part of the image you want to feature by holding down on the screen and manouvering the circle. Perfect for capturing that surfing action shot! It sounds obvious right? But there's nothing worse than capturing that gorgeous landscape shot only to realise that you weren't quite holding the camera straight (cue amazon search for tripods). Don't worry, Instagram has a straightening function which can be found through the adjust tool, so you can wave goodbye to any wonky shots. When it comes to your Instagram page, you'll (ideally) want to create a signature look or feel that stands out from the crowd - a style that is unique to you. Getting variety into your images is key for an inspiring feed, epecially if you're an avid travel photographer - we're talking colours, cultures, cuisines, landscapes, people, architecture and more. 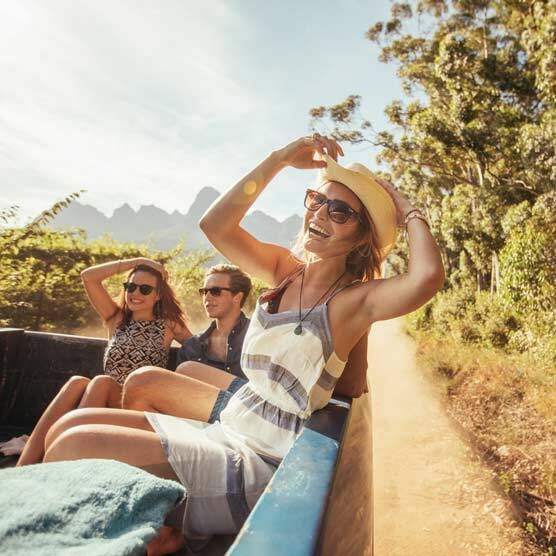 Whether it's a local dressed in their national costume, a food market featuring all the colours of the rainbow, or rugged mountains towering over a coastline - try and portray every aspect of your holiday. Want to spice up your travel photos? This clip-on mobile lens is the perfect gadget if you want to capture a different perspective - be it a classic beach panorama or a close-up nature shot. Have fun experimenting with features including fisheye, wide-angle (perfect for landscapes), active lens and more.